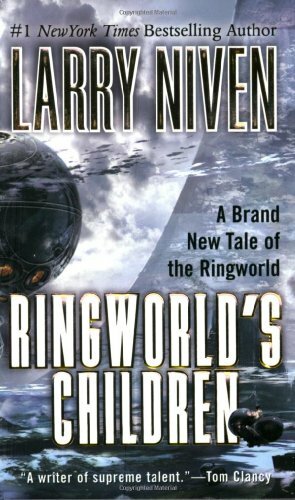 Ringworld was an important 1970 sci-fi novel by Larry Niven. It also was the start of the Known Space literary universe. There were several sequels, which weren’t necessarily all well-reviewed. The character Tunesmith appears in the 2004 one, Ringworld’s Children. During the 28th century humanity discovers a ring world. This is an artificial ring about one million miles wide and approximately the diameter of Earth’s orbit (which makes it about 600 million miles in circumference). It encircles a Sol-type star. It rotates, providing gravity that is 99.2% as strong as Earth’s through centrifugal force. The ring world has a habitable flat inner surface equivalent in area to approximately three million Earth-sized planets. Night is provided by an inner ring of shadow squares. These are connected to each other by thin ultra-strong shadow square wire. A group of explorers (including Louis Wu) find that there culture there is fallen. Myriad of low tech societies have formed on the structure. Strong genetic variance has occurred but most inhabitants are near-humans. Someone has been repairing and maintaining the ultra-vast structure. These are the Protectors, from the Pak species. There has been armed conflict with other high tech groups. A Pak can turn into a Protector through exposure to the Tree of Life, a specific type of plant. This can also work for species descended from the Pak, such as Humans. 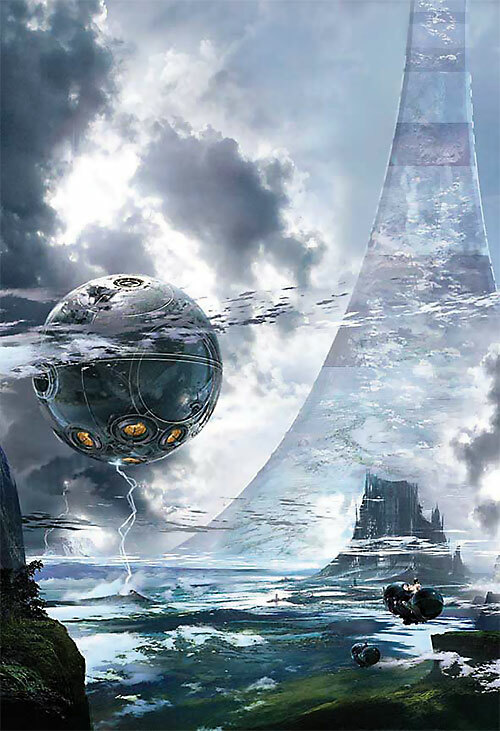 Which Protectors are in charge of Ringworld changes several times. At one point it is Tunesmith and his forces. Real Name: Not speakable by the human mouth. Group Affiliation: Night people of Ringworld. Base Of Operations: Repair center of Ringworld. Height: 5’10” Weight: 230 lbs. Tunesmith is a hyper intelligent alien, from the Pak species, in his Protector form. He thinks faster than anything Human and knows a person’s motivations better than they do. Extreme intelligence is one of the hardest things to model when you get away from the Tony Stark/Lex Luthor gadgetry types. Tunesmith is a super genius who manipulates worlds. His ability to learn is rapid and complete. Given 60 days he learned about the politics and geography of his world, mastered a dozen physical sciences, and solved several generations-old physics problem. Tunesmith’s ability to build devices is staggering in its rapidity and scale. He can create stuff as diverse a nanotech factory to create teleport disks, or new kinds of starships. There seems to be no hard sciences problem that he can’t solve given several weeks. One exception was the light speed barrier. Many things he can do instantaneously. As a protector Tunesmith is faster than anything human and has the reflexes of a ballerina on Crystal Meth. His skin has hardened to amour and his face has become a beak. The combination of brains and speed make it nearly inconceivable anything (in his context) but another Protector or a highly coordinated team attack could ever defeat him in combat. Tunesmith’s mind has some limits however. He continually needed help to understand complex human interactions or motivations. Because he is a Protector he is hard locked into the motivation of everything he does must be to protect his blood line. Unlike many Protectors Tunesmith has adopted all (a hundred billion or so) of the Ringworld’s Night People (a.k.a. “Ghouls”) as his family. Tunesmith could hurt a Ghoul if under dire need but it is doubtful he could kill one even to save his own life. Tunesmith feels that ruling the Ringworld (Ringworld) is the only way to make his people truly safe. Tunesmith used to belonged to a sapient race, the Night People. Tunesmith was well-educated, but his people only had Middle Ages-level tech. Back then the Pak Protector of the Ringworld was one Bram, working to consolidate his rule. But Human explorer Louis Wu had such a poor opinion of Bram’s moral worth that he went an exposed Tunesmith to a tree of life. As hoped, this hubris-filled move mutated the Night Person into a Pak Protector. Over the next few weeks, the transformed Tunesmith studied the knowledge of two advanced, high-tech cultures. Then he went to war to defend his world from invaders. After a complicated series of interactions and technical innovations (including stealing the fastest spacecraft in the universe), Tunesmith deployed a nano-virus. This was used to give the Ringworld hyperspace flight capabilities. Tunesmith then had his world vanish to an unknown location. Tunesmith looks like an old man painted on the canvas of a body builder. His joints are all swollen and his skin is a wrinkled leathery amour. As all his teeth have fallen out and his jaws have fused to his gums he has a beak like face. Yet to see him move is a study in grace and speed. Tunesmith is near-omniscient and impossibly intelligent. This gives him great power and thus, great responsibility. Tunesmith is fundamentally inhuman. He can do a good approximation of a human personality to interact with others, but in actuality he’s inscrutable and alien in his motivations. He can take even the most momentous decisions without any hesitation. Protectors do not use computers if they can help it. Out thinking each other is the only real fun they have. A computer removes them from this to some degree. Tunesmith’s ability to think ahead and plan is superhuman. He had contingency plans and devices set in place for a dozen layers of “what if” scenarios about everything. When faced with his own death in defense of his blood line he will not flinch. No degree of pain is enough to slow him. Even partially dismembered, he is fully goal-oriented and decisive. A Pak Protector in Human space would be a subtle thing in deed. He is likely to remains unobserved for decades as he manipulates societies and technologies to his benefit. If directly threatened and left without a choice, he will have weapons of massive scale capable of effecting even Superman or Green Lantern. Gravity polarizers in the 30 AP range, directed solar flares in the 35 AP range, comet impacts in the 15-30 AP range, etc.. Regardless of the circumstance Tunesmith cannot build faster than light travel devices although he can fix them. Tunesmith fully recalls everything he speed reads. Mind blank is against the use of skills to predict or understand him only. Lewis Wu (Low); Acolyte (Low). CPI: a protector must defend his bloodline at all costs; SPI: Megalomaniac; Strange Appearance; MPR: Tunesmith is genderless. CPI: cannot kill anyone in his family line even in self-defense. SPI cannot harm anyone in his family line even in self-defense. Source of Character: Children of Ringworld by Larry Niven.